When Final Fantasy VII hit PlayStations around the globe in 1997, featuring some of the most gorgeous graphics and CG cut-scenes gamers had ever seen, it single-handedly opened up the Western market to Japanese console RPGs. In years since, though, there’s been some contention over just how deserving developer Square’s biggest hit ever is of its exalted place in video game lore. Does it have a gripping story, or does the narrative become a confused mess after its midgame plot twist? Do the title’s numerous mini games flesh out its world, or is spending hours breeding giant flightless birds to race for sport both silly and boring? But no matter which side of the debate you fall on, there’s one thing gamers everywhere can agree on: Final Fantasy VII’s antagonist, Sephiroth, is a stone-cold badass. Now, Hollywood blacksmith Tony Swatton has brought the villain’s iconic weapon, the gigantic blade named Masamune, to life. Just how cool is Sephiroth? When the Final Fantasy team decided to make a prequel to Final Fantasy VII, 2007’s Crisis Core, the game was packed full of scenes showing Sephiroth effortlessly fighting off highly trained swordsmen. Final Fantasy VII’s protagonist, Cloud, on the other hand, was shown vomiting and getting stabbed. Aside from his impressive combat exploits, Sephiroth has an instantly recognizable design, and we see him here with his signature long hair, long coat, and very long sword. His weapon is the sort of thing that could only appear in Japanese fiction. No one would actually go to the trouble of forging a blade that massive in real life. We all love to handle swords. That’s a given. The look, the feel, the shape, even the smell of the steel gets the juice running to the very best places and gives us a unique rush. But, what gets them from lumps of steel to exquisite works of art that give us unparalleled protection and endless enjoyment? And, don’t take the easy way out and say Kult of Athena! That’s too simple. I think the better answer reaches back to a time when a certain group of people were invaluable to everyday society. A place and time when striding destriers thundered across the field and required iron shoes, a time when fields needed to be plowed with shares, and of course, a time when swords, glorious swords, and armor needed to be forged from molten steel. The answer, of course, is the blacksmith. For thousands of years, these men and women have harnessed the power of the sun to melt and shape the hardest substances on earth into stunning pieces of art for our giddy enjoyment and ever-growing collections. In this modern day, we still pay forges and swordsmiths thousands, literally, thousands of dollars to bend and hammer, mold and meld, solder and grind intricate pieces of metal – of every color, alloy, and hardness - to fit our weapon tastes and styles. And, in my experience, there is one that truly stands out about the rest. That man is Tony Swatton from Sword and Stone in Burbank, CA. As a young fan of fantasy and science fiction books from authors like Edgar Rice Burroughs and Robert E. Howard, Swatton had often visualized the armor and weaponry from his favorite sword and sorcery titles. “I wanted to have them, to hold them tangibly,” he said. The trouble was, he didn’t have the money to buy replicas. He decided to make his own and became very good at it. His business, The Sword and the Stone, has been going strong for 25 years, and his services range from knife sharpening, which costs four bucks, to massive armor projects that top $100,000. He’s got no end of work to do, and some years he’ll create more than 1,200 swords alone. Spend the evening in Baldur’s Gate at the official Sundering launch party! On Thursday night from 7 PM - 11 PM, Baldur's Gate will open its gates to travelers from across Faerûn for a one-of-a-kind event. Mingle with D&D designers, authors, and other industry luminaries while enjoying food, drinks, music, adventure and more. 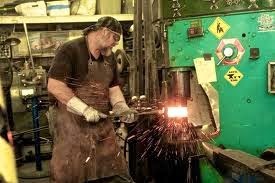 Master swordsmith Tony Swatton talks season two of his web series and the movie producer who had multiple accidents in his shop (hint: 1,000-degree metal shouldn't be handled bare-handed). 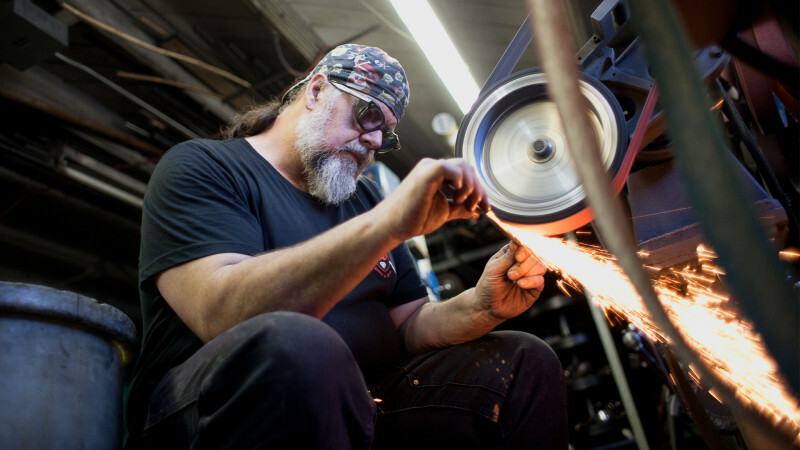 Though Hollywood blacksmith Tony Swatton’s weapons have been wreaking havoc in blockbusters for decades, the veteran props creator admits he doesn’t watch a lot of movies. Video games aren't his thing either. There's something a little old school about the master swordsmith, who prefers being out in his workshop to sitting behind a computer.